Wake-Up Time, Kiddies!!!! Why should the mysticks have all the fun? Across the boards of Dr. Volcano's Forbidden Website, we uncover dozens of gadgets, widgets, inventions and killing machines from the vaults of the Virtual Adepts, Sons of Ether, Technocracy and other random sources. Tomorrow Can Fit in the Palm of Your Hand! 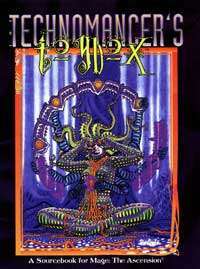 A long-awaited sourcebook for high-tech magick, The Technomancer's Toybox includes: A collection of neat stuff for Virtual Adepts, Sons of Ether, Technocrats and others; Storyteller hints for technomagickal gadgets; Weapons, armor, vehicles, web gear and more. This title was added to our catalog on May 10, 2004.